The award was meant to promote female participation in government, however, this year only men were honored. 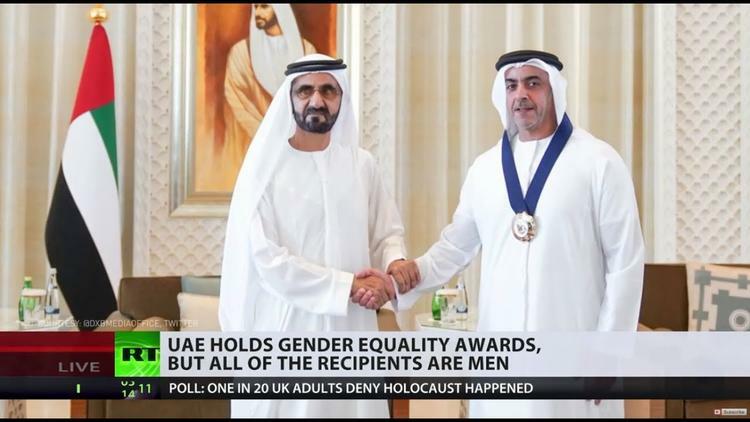 A storm of tweets bombarded the United Arab Emirates (UAE) after it was clear women had been completely excluded from this year’s gender-equality awards ceremony. “Gender balance has become a pillar in our governmental institutions,” said UAE vice president, Sheikh Mohammed bin Rashid Al Maktoum, as he handed out medals and certificates to the delegation of men representing the finance ministry, the federal competitiveness and statistics authority and ministry of human resources. “We are proud of the success of Emirati women and their role is central to shaping the future of the country,” he said, posing for a photo with the award winners. Introduced as a means to promote female participation in governmental roles in 2015, the UAE Gender Balance Index awards are generally awarded to those who have risen over and above to encourage gender diversity. As photos from the event began to surface, Twitter exploded with comment’s dripping with sarcasm. Last year, the Office United Nations High Commissioner for Human Rights reported concerns over the United Arab Emirates’ level of discrimination and injustice demonstrated against women and foreign workers and torture of prisoner.